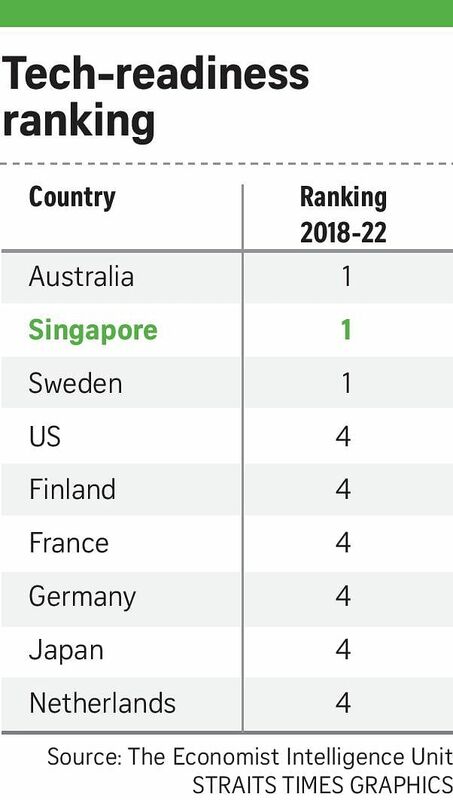 Singapore is poised to be one of the most technologically ready economies over the next few years, alongside Australia and Sweden, a new study by the Economist Intelligence Unit (EIU) has found. Titled Preparing For Disruption: Technological Readiness Ranking, the new report released yesterday looked at 82 of the world's largest economies, and focused on how future-oriented these business environments are. Three key elements of the ranking are access to the Internet (which looks at Internet usage and mobile phone subscriptions); the digital economy infrastructure (including e-commerce, e-government and cyber security); and openness to innovation (exploring international patents, research and development spending, and research infrastructure). Another key finding of the study is that government investment will drive a broad-based improvement in countries' tech-readiness in the next five years. Specifically, spending on e-government, cyber security and a robust e-commerce environment will increasingly be seen as a policy priority, the EIU said. In addition, China has seen strong growth in its patent applications in recent years. Nonetheless, based on EIU's measure of patent grants as a proxy for innovation, the United States is the clear front runner, the intelligence unit said. The previous ranking from 2013 to last year saw Finland and Sweden securing top spots, while the US and France join the top 10 countries in the latest ranking, as Libya and Angola retain the lowest positions. EIU country forecast director Emily Mansfield said: "Technological change is inescapable, and how well prepared governments, businesses and individuals are for disruption is increasingly important. The US will climb sharply in our ranking in the coming years as Internet access improves, and will remain the world leader for innovation clusters and new patents." Technological change is inescapable, and how well prepared governments, businesses and individuals are for disruption is increasingly important. The top-scoring countries in the Online Service Index of E-government include Australia, Singapore, Britain and Canada, closely followed by South Korea, New Zealand, Finland and France. One of the main drivers of e-government strategies, for instance, in the Asia-Pacific region, is the desire to reduce corruption. The top-scoring countries on the metric for cyber-security preparedness include Australia, Singapore, Canada, and the US. The EIU said patented inventions on their own are not enough to boost the productive capacity of an economy or to foster an innovative business culture. Innovation clusters, such as Singapore, that have closely linked businesses, suppliers, financing and research institutions all in one place punch far above their weight.